Last winter, it became clear that I would not be able to continue my half marathon training without warmer clothing. Specifically, I needed better coverings for my head and hands. I walked into the local outdoor gear shop looking for the appropriate accessories. Now, some of you will point out the contradiction of a knitter buying synthetic mittens. This point was not lost on me; I felt appropriately ashamed but cold, nevertheless. Actually, I had decided my enemy was not cold, it was wind. Not only that, but who wants to knit mittens to cover sweaty hands during a long run? Not I. So there I stood, talking to a salesman about the accessories to buy. He showed me some brand name, very expensive hats to block the wind. Neoprene, polypropylene, wind-block fleece, all materials designed to keep you warm. When I said I needed something specifically for a long run-a run lasting about two hours-he quickly abandoned the hats he’d shown me, instead turning to a different line. The answer, he said, was wool. Specifically, a $50 wool hat whose materials had been specially engineered to keep one warm in the cold and provide enough ventilation to prevent overheating. What did he mean by specially engineered materials, I asked. Isn’t that just what wool does? Generations of sheep represent the only technological innovators on this front, as far as I was concerned. I’m not saying there is no room for technical fabrics. After all, I would never be able to run through the winter without fleece-lined, polypropylene tights. However, it is clear to me that no amount of human engineering can compete with thousands of years of selective pressure on sheep to produce the most effective insulation from the cold. I need not tell you how I made it through the rest of the winter, of course. I am cheap and unabashedly so. I dug out an old wool hat I knitted years ago and stole the tufted mittens I knit for Aaron. To my amazement, 5 a.m. runs in -15 degree weather were no big deal. Actually, to be completely honest, the 5 a.m. part was still a big deal but the bitter cold was not. I’ve been considering this experience lately, as it comes time to find Beatrix some warm winter clothes. I decided to design a heavy wool jacket for her as a cheap alternative to a winter coat. In fact, I find some of my heaviest wool sweaters far warmer than my biggest parka. Although my sense of parental guilt will likely drive me to the store this winter to buy her a coat she’ll quickly outgrow, I hope this heavy sweater lasts her two winters. 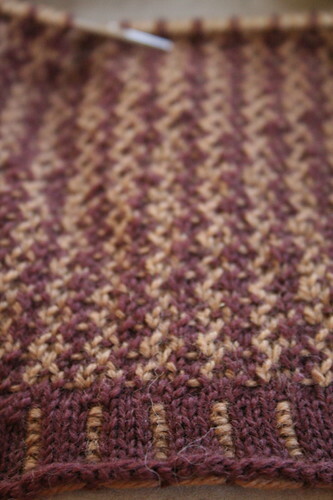 Last week, I sent the pattern to a handful of test knitters. Hopefully, I will be able to offer it to you soon! In the meantime, I have some stealth mittens under way at the moment. I will certainly share them with you next week when they have met their intended recipient. Until then, I’ll leave you with the beginnings of Bryant’s Slipover vest (Ravelry link), a project I’m knitting for my cousin Ida. I promised to knit this last year but I found myself sidetracked by other things. Since I will be seeing Ida in Boston next week, I decided to finish it so I could leave it with her! Wish me luck on that one, the gauge is 7.5 sts/in and I’ve not yet reached the waist. The eyes on that child! She is just beautiful!! Oh, and the sweater ain’t bad, either, lol. I’ll be watching for that pattern, it looks very warm. Quick, quick, quick on releasing that pattern. Its pretty much what I’ve been looking to make for my 4 year old. Hope the pattern is sized up to that. Can’t wait. The patterned jacket does look very nice indeed. I cant wait for it to be released either. She is a very pretty model too. wow! Awesome jacket. I’d like for me!! I have been considering this winter knitting for running also – I want this to be the year I keep my running going past Halloween! 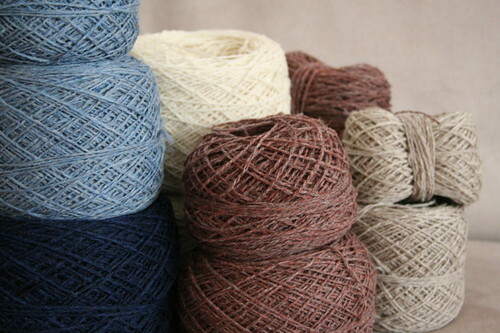 I think some hand-knitted wool items (perhaps superwash…I know how much I sweat…) would be just the trick. I just have to do the actual knitting part. I am always seduced by glitzier sweaters and socks and shawls, the accessories always suffer! 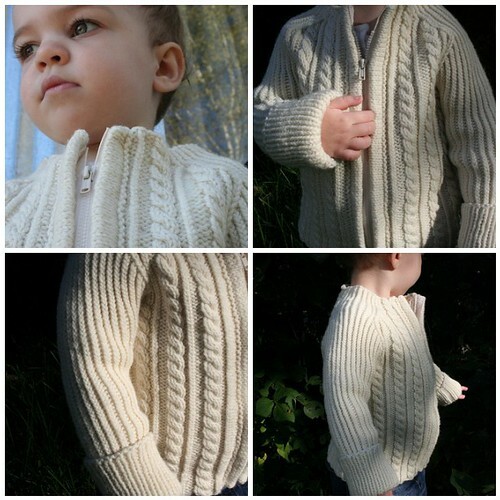 Love that cabled sweater – might have to figure out how to make it adult sized once you get a pattern up! Beautiful sweater! I can’t wait to see the pattern! Yeah, the hat I bought for running (before I knit) was fleece-lined wool. It was soft on my forehead and also warm. The vest looks really great! I love that color combo. Hmmm, does your cousin have any affiliation with BC per chance? Beatrix already has that soulful, reflective Rowan model look — now that’s precocious. Her coat looks absolutely cozy and lovely. I like the long folded sleeves too. Clever and stylish. Why buy when you can make. It’s not cheap, it’s unique and individual. my love for wool happened when i was white water rafting in maine the first weekend in may. there was still snow on the ground in spots and the day we went it was gray and drizzly. anyway, over my wetsuit i wore a wool sweater and wool mittens and even soaking wet, my hands stayed warm. special engineering indeed. and you know you’ll have to design that sweater for big people. so cute. I find if a wool hat is knit dense enough (or double knit) it is warmer than polarfleece any day! I also want to eventually line a wool hat with polarfleece – the best of both worlds I think! Ideal for walking the dogs at 5am during the winter! Can’t beat the woolly warmth. I heart wool. I am also thinking that I well try training for a half-marathon when I am allowed to do so after progeny 2.0 joins the fray. Maybe the prospect of cute running gearing knit for myself will get me excited about the running. I need to eat less pie. That sweater is such a cute pattern! Can’t wait to see it. Love the pretty pretty vest too! Adorable warm wooly winter sweater-coat – they can’t make those store coats as cute as that – no way!! I feel bad that I haven’t done an honest to goodness long run in months. Now it is getting chilly again, and I don’t want to have a poor showing in next year’s half marathon. Time for a wool hat and mittens and a kick in the pants to get out the door early enough! Alan and I had a conversation the other day about his love for this expensive hat of his. It’s just a skullie that’s made out of wool. He won’t fess up how much he paid for it, but it was too much and he got it from some camping store. Silly. I’m with you – I’m so cheap when it comes to running gear in general. I’ve been running in the same stuff for like three or four years now. If it works, and it doesn’t give you blisters, why mess with it? That sweater is gorgeous. Looking forward to the pattern. Your baby girl is getting SO big! I. love. that. jacket. Wow, it’s great. I’ll definitely be purchasing the pattern from you! The sweater jacket is gorgeous! I love the detail in the different stitches! very gender neutral too! 5 am run? Wow! I still haven’t figured out how to do that since SP was born. Maybe after she’s weaned it could happen? I love that jacket! I definitely agree that a heavy wool jacket is way warmer than a store bought item. Especially w/ cables. So glad to find your blog! Your patterns are smart and stylish and your photos are fabulous. The family is pretty handsome, too. i love that little sweater. and the child is cute too.